I often get asked the question, “What are the best Toy Story toys?”. Ever since the original Toy Story was released in 1995, there have been a staggering amount of toys based on the characters that have been sold. While the answer is one of personal preference, the Toy Story Collection line by Thinkway Toys is easily made up of the most well-made, high quality Toy Story toys that you can buy. Didn’t you ever think to yourself, “I’d like to own the toys from the Toy Story films. Not just any toys, though. Toys that are just like the ones in the movies.” Well, Thinkway Toys has you covered. Collaborating with Pixar, the toy manufacturer obtained original Disney/Pixar digital data files for the characters, which allowed them to recreate the toys exactly the way they were meant to be. The result? The Toy Story Collection toys arguably represent the most accurate Toy Story toys on the market. They are the same height, they speak the same lines, wear the same colors and the same facial expressions as their counterparts in the films. Even their packaging is accurate to the ones shown in the movies. Each toy also comes with a Certificate of Authenticity. Up to this point, there have been 11 toys released under the Toy Story Collection banner. I’ve listed them all below, along with pictures for each one. John Lasseter, director of Toy Story and Toy Story 2 and now CCO of Disney and Pixar, is known to be an avid collector of toys. He talks passionately about these toys in the accompanying videos. Everyone’s favorite Cowboy comes to life like never before! Highly detailed deluxe film replica from DISNEY/PIXAR’s digital data. 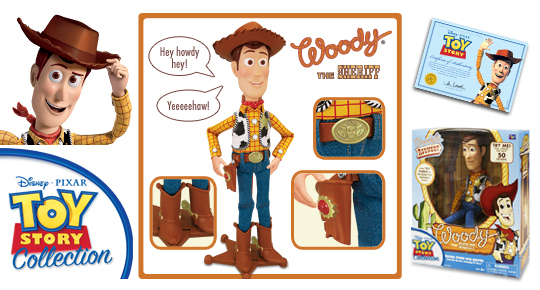 Pull his string for classic “Woody Toy” phrases. Talk to him and he responds as “Andy’s Room Woody”. He even knows if you’re talking loudly or softly and reacts. Includes a Toy Story Collection Certificate of Authenticity. BONUS: Sheriff star display stand. Highly detailed film replica from DISNEY/PIXAR’s digital data. Turn his tail to activate his talking/roaring feature with motorized arms and head. 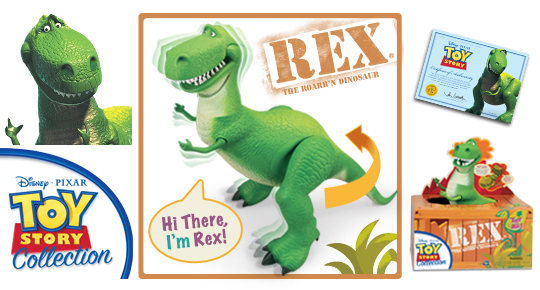 Talk to Rex and he’ll respond with voice and movement. He even knows if you’re speaking loudly or softly and reacts. 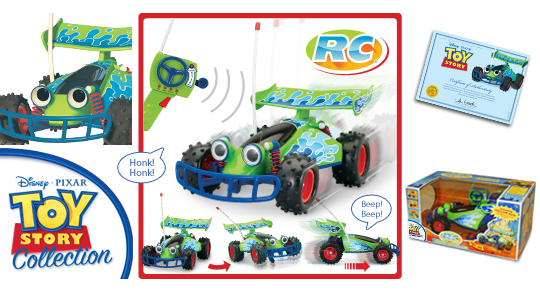 RC’s playful personality is revealed with bouncing action, horn honking, free motion eyes, multiple expression and driving sound effects. Move RC forward, in reverse or spin 360° in either direction using the Wireless Remote Control. Independent left and right rear wheel drive for quick, on the spot pivoting. Amazing FOLLOW MODE: Call RC and he’ll detect your location and come to you! Autonomous EXPLORE MODE. Press the Explore button on the remote and RC will cruise around on his own without remote guidance. 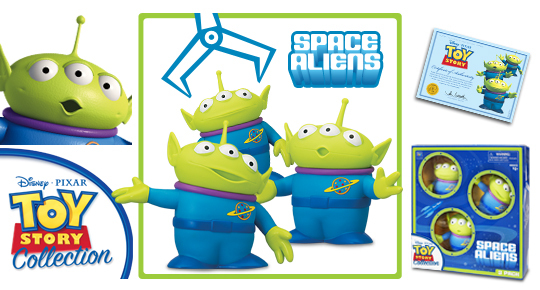 This highly detailed extraterrestrial trio is produced from DISNEY/PIXAR’s digital data. Each 3 eyed Space Alien has a unique facial expression and pose. The one, the only, the original, most accurate Buzz Lightyear ever produced!! Fully poseable including fingers, wrists, elbows, shoulders, waist, ankles, knees and legs! Push his red oval chest button for classic “Buzz Toy” phrases. Press the blue oval chest button and he responds as “Space Ranger Buzz”! He even knows if you’re talking loudly and reacts. 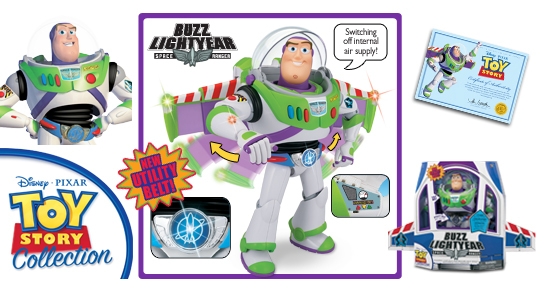 Talk to Buzz and he’ll respond to your voice in Talk Back Mode (green oval button for ON/OFF Talk Back feature). Press his red chest button for pop-out wing action and light-up wing tips. Level sensor knows when Buzz is in a horizontal flying position or standing vertically and responds with flying and landing sound effects! Press his arm button for laser light-up and sound effects. Open or close his helmet or arm communicator and he reacts with related phrases and sound effects. Soft rubber waist and glow-in-the-dark green trim. This is the delusional Buzz from Al’s Toy Barn in Toy Story 2! Includes a light-up utility belt. Press the buckle for unique voice, light and sound effects AVAILABLE ONLY with this Buzz! Push red oval chest button for classic “Buzz Toy” phrases. Press blue oval chest button and he responds as “Space Ranger” Buzz with moving head action! He even knows if you’re talking loudly and reacts. Speak to Buzz and he’ll respond to your voice in Talk Back Mode (green oval button for ON/OFF Talk Back feature). Press red round chest button for pop-out wing action and light-up wing tips. 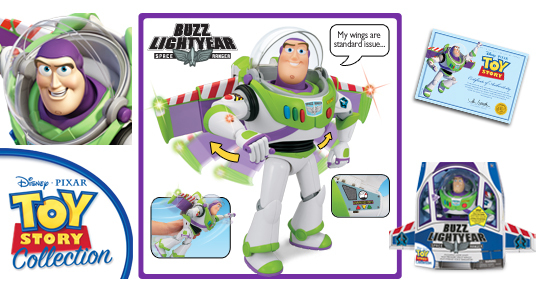 Level sensor knows when Buzz is in a horizontal flying position or standing vertically and responds with flying and landing sound effects. Mr. 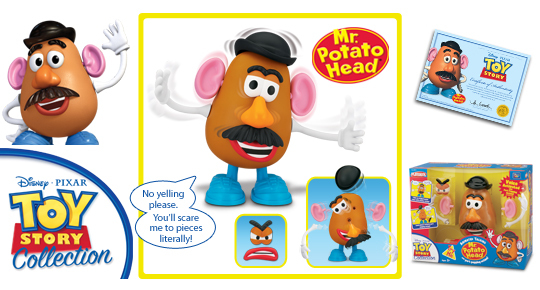 Potato Head comes to life like never before! Has detachable eyes with eyebrows, ears, nose with moustache, mouth, arms and hat. Press his hat for classic Mr. Potato Head banter with wacky face and body movements. He also reacts to the sound of your voice, but be careful, loud noises activate his POP OFF Action! His arms, eyes, ears, nose with moustache POP OFF! Press the button on his back for manual pop off action. Includes 2 sets of eyes and mouths for happy and angry facial expressions. Highly detailed soldiers from DISNEY/PIXAR’s digital data. Variety of soldier poses and weaponry. Gallop into the sunset with Woody’s trusty steed! 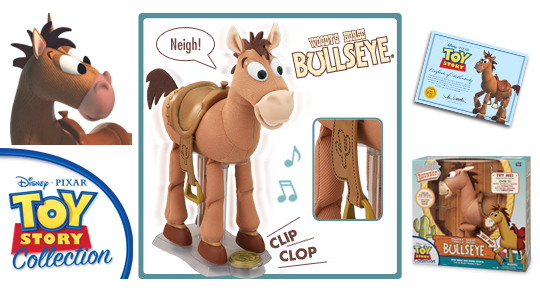 Bullseye is crafted using DISNEY/PIXAR’s digital data. Neighing and clip clop sound effects. Detailed vinyl saddle and stirrups with floppy rag doll legs. BONUS: Unique Woody’s Roundup stand to display Bullseye. Highly detailed film replica created from DISNEY/PIXAR’s digital data. 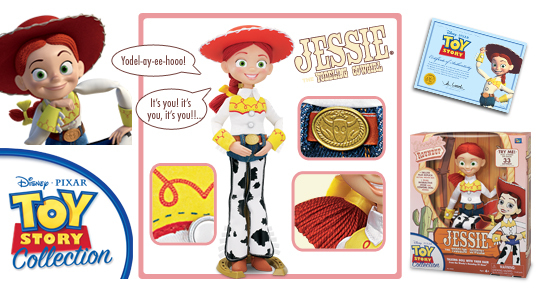 Pull string for “Jessie Toy” phrases and yodeling. Talk to Jessie and she’ll respond with “Andy’s Room Jessie” phrases. Jessie responds to the tone of your voice and knows if you’re shouting or talking softly. BONUS: Horseshoe shaped display stand. Soft, huggable and Strawberry scented! He loves when you give him a hug and he reacts! Lotso responds to your voice and even knows if you’re talking loudly or softly. Press left paw for “Live Lotso” phrases and he responds to your voice in talk back mode. 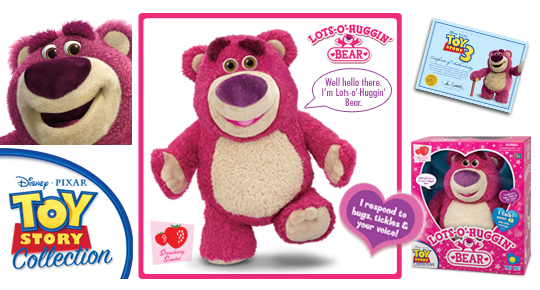 Press his right paw for “Toy Lotso” phrases. Tickle his left or right foot to make Lotso laugh. 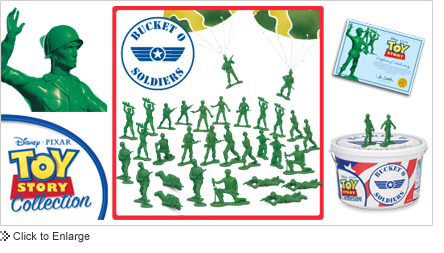 It is Thinkway Toys’ incredible attention to detail with the Toy Story Collection toys that elevates these toys to a level above most other toys. For example, the Lotso bear is even strawberry scented, just like in Toy Story 3! I have no reservations about recommending these toys, as they are my personal favorites. They are a bit on the expensive side, but considering how great these are, you pay for their amazing quality. You can find them at major toy retailers like Toys ‘R’ Us, Target, K-Mart, Amazon, Walmart, etc. What do you think? Do you own any of these? What is your favorite Toy Story toy? Please share your thoughts below. Note: Images and product descriptions are courtesy of Thinkway Toys. Videos are courtesy of Disney Living.